My good friend Susan Hessel is recovering from surgery today for breast cancer. Last week, to explain to her friends, she wrote a piece about her own experience with this disease. Always smiling, always optimistic about what life was handing her, I asked her if she would kindly allow me to share with my own readers her words that are far more eloquent and informative than anything I could write here about this disease that strikes so many women today. She consented to me blogging her words; she herself is a wonderful writer and author of books---here is a list of books from Amazon that she has been involved in---and has a sense of humor that allows her to redefine even the notion of cheese-head as you can see from her Facebook page. 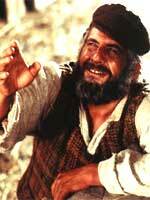 It’s a joke among Jews that we really didn’t need to be chosen in so many ways that we are. Now I get to add breast cancer to that list. Or do I? It’s certainly how I felt when my doctor called me a few weeks back and told me that she and the breast radiologist had been talking and thought that because of my “ethnicity” they should go one step further and I should have a breast MRI. Of course, to blame my parents, who are no longer with me, would be tacky and inappropriate. It would open me to similar feelings from my kids. They chose lousy parents heredity wise, but that’s another story. I am of Ashkenazic – Central/Eastern European Jewish descent. And yes, I do have breast cancer and am about to have a mastectomy. But who knows if it is genetic or something related to the environment or simply the flying fickle finger of fate (think Laugh-In television show in the 1960s). In 1995 and 1996, studies of DNA samples revealed that Ashkenazi (Eastern European) Jews are 10 times more likely to have mutations in BRCA1 and BRCA 2 genes than the general population. Approximately 2.65 percent of the Ashkenazi Jewish population has a mutation in these genes, while only 0.2 percent of the general population carries these mutations. Further research showed that three specific mutations in these genes accounted for 90 percent of the BRCA1 and BRCA2 variants within this ethnic group. This contrasts with hundreds of unique mutations of these two genes within the general population. However, despite the relatively high prevalence of these genetic mutations in Ashkenazi Jews, only seven percent of breast cancers in Ashkenazi women are caused by alterations in BRCA1 and BRCA2. I really, really, didn’t know about that Ashkenazic Jews were at higher risk. And, I have done more than my fair share of medical writing. It was probably information that I needed to know but wished I didn’t know. At any rate, I was talking with a woman who had breast cancer several years ago and she only discovered after genetic testing that she was Jewish. (The geneticist wishes her a Happy Passover.” Her family had decided to become Christians after coming to this country at the turn of the 20th century. But it was funny, this woman remembered hearing Yiddish many years ago and understanding what the women were saying. At the time she thought she was clairvoyant. • Certain ethnic groups are at increased risk for having BRCA1 and BRCA2 mutations; three particular mutations are more common among Ashkenazi Jews. • Women with mutations in BRCA1 or BRCA2 are more likely to develop breast or ovarian cancer but are not guaranteed to do so. • A BRCA1 or BRCA2 mutation is more likely to be found in an individual with a family history of particular cancers. • Women with BRCA1 or BRCA2 mutations are more likely to get cancer at a younger age than the general population. • Men can also have BRCA1 or BRCA2 mutations, which puts them at an increased risk for prostate, breast, and some other cancers. • A BRCA1 or BRCA2 mutation can also be passed down through the father so it is important to consider both sides of the family history. • The decision to get tested can be very complicated. Talk to your doctor or a genetic counselor if you are interested in testing. What does this all mean? I guess to those of us who are Jewish women, we should be very vigilant. Get regular mammograms and don’t panic. Hey, that also applies to non-Jewish women. I didn’t think I had any family history of breast cancer, but my grandmother died of some kind of cancer when I was 3. My friend who had cancer and later discovered she was Jewish suggested there was no way of knowing if whatever cancer my grandmother had was lymphoma as we know it today. Then maybe the cancer was in the lymph and then spread. I’m going to ask for genetic testing. My mom and I used to joke about the expression, “Now is not the time to panic.” We wondered if they – whoever they are – would send out a memo or appear on TV and radio to announce, “Now is the time to panic.” At that point we would run in circles with our hands up in the air screaming. The good news is with technology, they can send the panic message via email, text, by Twitter and Facebook. Susan came out of surgery today. She wouldn't be awake enough to read her own words on the blog but I am glad to count myself as one of her friends. She is a courageous woman facing a terrible disease; a disease that threatens the lives and well-being of women across America and around the globe. 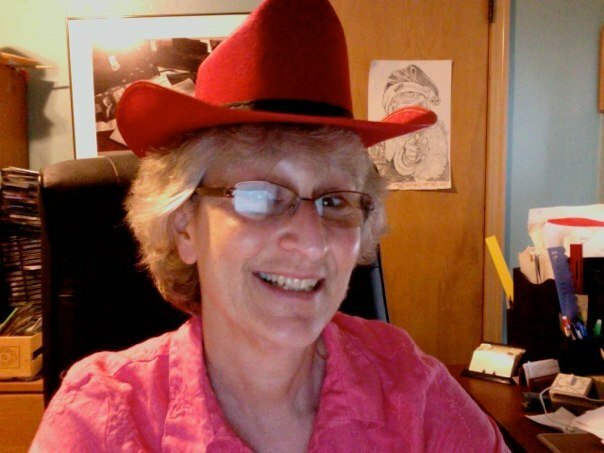 I stand with Susan T. Hessel. But once in awhile God, couldn't you have chosen someone else? I really felt like an "amateur investor" today when I needed to sell my shares of Oshkosh (OSK) after they hit and passed my 8% loss tolerance. Like the rocket on the way up, the stock turned around and plunged with the market. I am still very impressed by the company, the $2 billion in new contracts for MRAP's and would consider this a very worthwhile stock to be acquiring shares in--as soon as the technicals show a little bit of support. Like a car, I have my driving rules (and I was 'speeding' with my Oshkosh purchase! ), my seatbelts and my airbags---in order that I can survive in the chaos of the investment world. Like airbags in vehicles designed to limit injury to inhabitants of colliding motor vehicles, my trading rules to limit losses are designed to get me out of a bad situation intact--or at least only slightly injured! These loss limits, which I have described many times elsewhere on the blog, include limiting losses to (8)% after an initial purchase, break-even after a first partial sale, and then to 1/2 of the highest percentage gain after two or more partial sales at appreciation targets. For instance, I like to sell 1/7th of a holding after a 30% appreciation of a stock after an initial purchase. In that case, if I have only sold a portion once, I would sell if it should then decline to my purchase price--my break-even level. My next 'targeted sale' is at a 60% appreciation from purchase level. After selling another 1/7th of my remaining shares, I would mentally (or actually) be moving up my sale point on the downside to a 30% appreciation point. Thus, I try to limit losses and preserve gains even if a stock, like Oshkosh (OSK), should dip in price. I am aware that many stocks like Oshkosh with underlying great news will likely rebound. And I shall miss many of those rebounds with these rather rigid trading rules. But one of my main goals in this account is preservation of capital and enforcing a trading discipline to insure my own behavior. And thus the sale of my OSK shares. The details? I sold 80 shares of Oshkosh (OSK) (my entire position) at a price of $28.16 today (8/6/09). These shares had been purchased at $30.73 on 8/3/09 (just 3 days ago!) resulting in a loss of $(2.57)/share or (8.4)% since purchase. Finally, what to do with the proceeds of this sale. While I have been bending the rules (to little avail!) lately, with my swaps of positions as I have been truly trying to 'chase performance', a sale like this reminds me of my own 'amateur' status, and is a signal not to be reinvesting proceeds but rather to be 'sitting on my hands' with these funds. I shall be adding a new position when one of my remaining holdings hits an appreciation target on the upside and when once again I can sell 1/7th of that holding on 'good news'! Thanks again for visiting! I shall try to learn from this sale as well---as much as I like Oshkosh (OSK) and am impressed by the contracts obtained, that we are now dealing with volatile markets that have little follow-through momentum....so chasing performance, at least currently, may be a poor game to be playing! Switching from Haemonetics (HAE) into Oshkosh Corp. (OSK) "Trading Transparency"
As is part of my blogging, I wanted to share with you a 'swap' I made out of my position in Haemonetics (HAE) and into Oshkosh (OSK). Both of these are mid cap stocks but that is where the similarity ends. On Monday, August 3, 2009, I sold my 50 shares of Haemonetics (HAE) at $55.08 after what I viewed as both technical weakness on somewhat less than stellar earnings, and purchased 80 shares of Oshkosh Corp (OSK) at $30.73 on what I viewed as compelling news on this 'old favorite' of mine and a nearby Wisconsin-based firm. Oshkosh (OSK) closed at $32.22 today, up $1.28 or 4.14% on the day...so I am already a few percentage points ahead on this purchase! Haemonetics (HAE) is a stock I have purchased two times, originally picking up 50 shares on October 27, 2008, at a cost basis of $51.54, so I had a gain of $3.54 or 6.9% since purchase. So it wasn't exactly a waste. And I do need to develop more patience with all of my holdings! 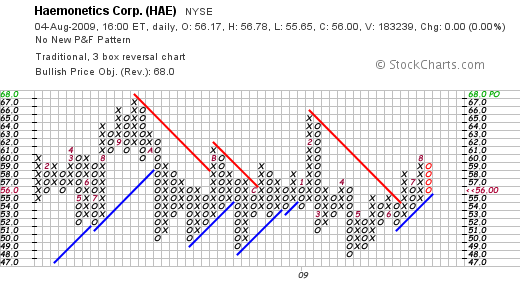 Basically Haemonetics (HAE) reported 1st quarter earnings results yesterday. They beat expectations of $.65/share in earnings coming in at $.69/share. However, 1st quarter revenue missed expectations at $154.1 million while analysts had been expecting slightly more at $156.6 million. And has been so common, the market over-reacts on earnings news that even slightly appear to be failing to meet expectations. And Haemonetics (HAE) was no exception dropping 4% plus that day. I pulled the plug on the stock which while still showing promise on a fundamental basis, was acting as a drag on my portfolio. Shortly after starting my blog in 2003, I wrote up Oshkosh (OSK) on June 12, 2003. I "revisited" Oshkosh (OSK) on February 2, 2006, and even did a podcast on the stock. My stock club has been in and out of this stock and last month acquired a small position and added to it this evening with a few more shares. As background, it is important to know that Oshkosh (OSK) is an important supplier to the United States military, and also other allied military forces, for mine resistant ambush protected (MRAP) vehicles. IED's (improvised explosive devices or roadside bombs) contribute 75% of the casualties to coalition forces in Afghanistan as this article explains. 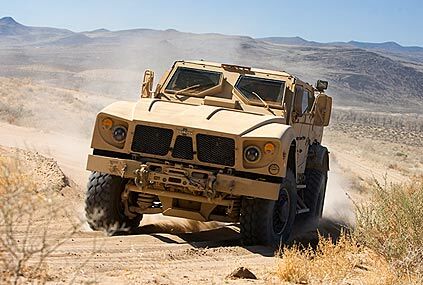 On July 1, 2009, Oshkosh (OSK) announced a $1.05 billion contract with the United States military for 2,244 M-ATV (mine-resistant all-terrain vehicles) beating out Force Dynamics, a partnership between Force Protection (FRPT) and General Dynamics (GD), as well as other competitors Navistar (NAV) and BEA Systems (BA) to land this contract. That contract alone was enough to get my stock club last month interested in re-purchasing shares of OSK which had previously declined and were now rebounding with the news. What clinched the deal in my mind was the announcement on July 31, 2009, of Oshkosh (OSK) winning an additional $1.06 billion order for another 1,700 of these M-ATV's. So when Haemonetics (HAE) hiccupped with the earnings report, I was more than ready to take the jump to Oshkosh (OSK) and purchased shares as noted above. This stock certainly doesn't clearly fit into my usual 'steady growth in earnings and revenues' type company. In fact, on its latest earnings report on July 30, 2009, the company reported sales of $1.2 billion in the quarter (down 36% from the prior year) and a loss of (.36)/share exceeding the expected loss of $(.30)/year expected. So really a mediocre earnings report. The Morningstar.com '5-Yr Restated' financials shows the previous record of revenue growth from $2.3 billion in 2004 to $7.1 billion in 2008 slipping to $6.5 billion in the trailing twelve months (TTM). Positive earnings growth turned into large losses from $3.58/share in 2007 to a large loss of $(16.67)/share in the TTM. Outstanding shares number only 75 million. Free cash flow has remained positive and improved recently from $121 million in 2006 to $315 million in 2008 and $642 million in the TTM. The balance sheet remains solid with $1.8 billion in cash and other current assets compared to current liabilities of $1.3 bilion. In any case, the massive orders and the potential for more of these orders from the military combined with the small # of shares and the strong price momentum convinced me that I needed to climb abord Oshkosh (OSK) and see if we could ride this one over some difficult market environments! Thanks again for stopping by and visiting! If you have any comments or questions, please feel free to leave them right on this website or email me at bobsadviceforstocks@lycos.com. Swapping PetSmart (PETM) for TJX Companies (TJX) "Trading Transparency"
Before I write about the 'swap' I made with PetSmart (PETM) and TJX (TJX), I want to talk to you a little about "chasing performance". There is a good article on attempting to improve results by chasing after the best and latest hot stock or fund that you might want to read. In general, it is counterproductive to be switching investments or funds in pursuit of investments that have performed well in the past. Simply doesn't work. Perhaps as an amateur investor, I am guilty of the same amateur mistakes that others make. So with that in mind, after my latest review of TJX, I have been growing impatient with my PetSmart (PETM) stock which appeared to be underperforming my other holdings. 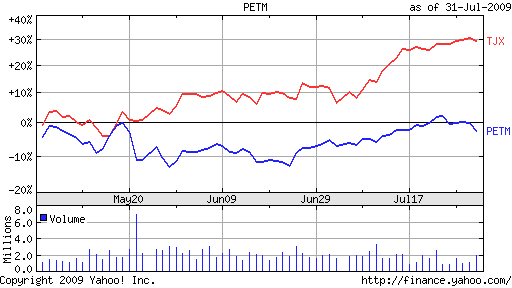 We can see how TJX has been outperforming PETM. But that doesn't mean that the divergence in performance shall continue. But it might! In any case, I grew impatient and pulled the plug swapping out my shares of PETM for TJX. On July 31, 2009, I sold my 90 shares of PETM at $22.46/share, and purchased 60 shares of TJX at $36.50/share. The PetSmart shares were purchased 5/21/09 at a cost basis of $20.41/share. Thus I had a nice gain of $2.05 or 10% since purchase. TJX closed Friday at $36.23 so I was a little 'under water' on this purchase already. Thanks so much for visiting my blog! If you have any comments or questions, please feel free to leave them right here or email me at bobsadviceforstocks@lycos.com. Hello Again my friends! It is late and I am having a bit of seller's remorse. Earlier today I parted company with my shares of Colgate (CL) because of a slight miss on revenue while earnings exceeded expectations in the latest report. I think I got a bit 'self conscious' of the public nature of my blogging and trading and probably rushed that trade. Over and over we have seen stocks pummeled on announcements that really aren't bad. The market wants to sell on good news and sell more on bad. It is probably best not to respond to these actions after earnings announcements and instead concentrate on breathing slowly, relaxing, and letting the chaos pass as it always do. I certainly like Coca-Cola (KO), but Colgate-Palmolive is truly a phenomenal world company. I blinked when looking into the face of the irrational sell-off. Like a 'weak sister' as investors like myself are called I dumped my shares grabbing my small gain and moved into Coke. Not exactly the cool-headed investor I pride myself in being. Perhaps that is what separates an amateur investor like myself from a professional. Perhaps knowing this is the first step on that road. We can certainly hope. As I write over and over, it is important to have specified sale points for both good and bad price moves. It is also important to identify significant fundamental negative reports that might trigger a premature sale. However, this kind of volatility is not a game I should be playing or even get caught up in. I hope all of you can learn from my own actions as well! In any case, it is late, tomorrow is certainly another day, and I still have a portfolio of mighty fine companies. I just miss my Colgate already and will be sure to keep it on my list of stocks to revisit in the future. Colgate Palmolive (CL) and Coca-Cola (KO) "Trading Transparency"
Colgate-Palmolive (CL) is definitely one of my favorite 'comfort stocks'. However, I wasn't very comfortable when they reported their 2nd quarter results that beat expectations on earnings but missed on revenue. As reported today before the open, profit came in at $1.07/share exceeding expectations of $.98/share, but revenue came in a little light at $3.75 billion, under the expected $3.83 billion. Not really a big deal imho, but enough to spook skittish investors (like myself) who really don't enjoy hanging on to a stock when the market roars ahead and the stock price drops on a small disappointment. Earlier today I sold my 43 shares of CL at $71.92/share. These shares had been purchased 4/24/09, just 3 months ago at a cost basis of $59.55/share. Thus, I had a gain of $12.37/share or 20.8% since purchase. Preserving gains is about as important as avoiding losses in my strategy and I chose to swap out of Colgate (CL) and purchased some shares of Coca-Cola (KO) hoping that my portfolio would 'go better with Coke'! I went ahead and purchased 50 shares of Coca-Cola (KO), a slightly smaller position than my Colgate, at $50.39/share this morning. Let's take a brief look at Coke and see if it makes sense and might offer almost as good an opportunity for this investor as my shares in Colgate! On July 21, 2009, Coca-Cola (KO) reported 2nd quarter results. Earnings climbed 43% to $.88/share vs. $.61/share last year...but last year's results were dampened by $.40/share in one-time restructuring charges and asset 'write-downs'. Sales dipped 9% to $8.27 billion. So in fact, this was less than stellar. Looking at the Morningstar.com "5-Yr Restated" financials on Coke, we can see the steady revenue growth from 2004 at $21.7 billion, increasing to $31.9 billion in 2008 only to dip slightly to $31.7 billion in the trailing twelve months. Earnings have increased from $2.00/share in 2004 to a peak of $2.57/share in 2007, dipping to $2.49/share in 2008 and $2.43/share in the TTM. Again demonstrating a little weakness recently. Free cash flow is not a problem with KO, with $4.5 billion in 2006 increasing to $5.3 billion in the TTM. This contributes to a balance sheet with $6.8 billion of cash, $7.9 billion of other current assets balanced against current liabilities of $13.2 billion. The company also has a moderate level of $9.2 billion in long-term liabilities. Looking at some valuation numbers on Yahoo "Key Statistics", we can see that this is a large cap stock with a market cap of $116.5 billion. The trailing p/e is a moderate 18.63 with a forward p/e of 15.16. The PEG ratio, however, is a bit rich at 2.44 suggesting a bit of a premium price for this stock relative to its growth rate as estimated. There are 2.32 billion shares outstanding with 2.30 billion that float. Currently there are 27.14 million shares out short representing 2.7 trading days of volume (the short interest ratio) below my own 3 day cut-off for significance. The company pays a $1.64 dividend yielding a forward dividend yield of 3.3%. The company last split its shares 2:1 in May, 1996. And the chart? 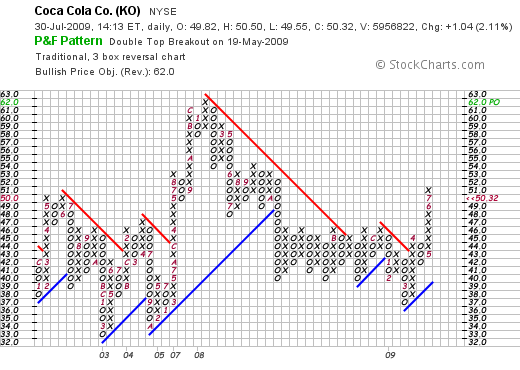 Looking at the 'point & figure' chart on Coca-Cola (KO), we can see that the stock hit a high of $62 in January, 2008, before pulling back as low as $37 in March, 2009. The stock recently has broken out past resistance and is acting quite strong at its current level of $50.32. Quite frankly, I like Coca-Cola (KO) stock as a long-term growth and recovery play on the global economy. It is a 'comfort stock' from my perspective, but the numbers are not quite as strong currently as I might like to see in a stock in my portfolio. Technically, the stock appears to be anticipating improved numbers as the stock price has appreciated nicely the past couple of months. I am not sure if this stock is the 'Real Thing' or not. However, as I build my portfolio, while stepping aside from Colgate--at least temporarily--I shall try to see if this stock has enough 'fizz' to help move my portfolio in the right direction. If instead it turns out to be 'flat' instead, well I can always move on with another stock holding! Thanks again for stopping by and visiting my blog! If you have any questions, please feel free to leave them on the blog or email me at bobsadviceforstocks@lycos.com. This past month I presented TJX Companies to my Stock Club and they went ahead and bought a few shares for our portfolio. I do not personally own any shares of TJX Cos. (TJX) but do think it deserves a spot in this blog. TJX closed today (7/28/09) at $36.25, up $.35 or .97% on the day. "The TJX Companies, Inc. operates as an off-price retailer of apparel and home fashions in the United States and internationally. It sells off-price family apparel and home fashions through T.J. MAXX and MARSHALLS, HOMEGOODS, and A.J. WRIGHT in the United States; WINNERS and HOMESENSE in Canada; and T.K. MAXX and HOMESENSE in Europe." In general we have an AWFUL retail environment in the US as well as elsewhere. As this article from the NYTimes points out, June, the latest recorded figures available, continued the trend of weak sales numbers for United States retail firms. "On Thursday, the industry posted a 4.9 percent sales decline in June, in contrast to a 1.9 percent increase a year ago, according to Thomson Reuters, which said the decline capped the longest negative streak on record." Then WHY would I be writing up a retail firm in this sort of awful environment? Well it turns out that as one might expect there are always some bright spots even in negative news. In fact, TJX has been bucking the trend and last month reported positive same store sales growth with a 4% same-store sales increase! It seems that customers are still seeking those 'name brands' normally found in more expensive chains but now being sold at TJ Maxx and elsewhere as part of 'close-outs'. Anyhow, that's my take on this apparently paradoxical retail report. "TJX now anticipates second-quarter earnings from continuing operations of 56 cents to 59 cents per share. Its previous guidance was for earnings of 43 cents to 49 cents per share." Apparently, as the story relates, analysts from Thomson Reuters had been expecting a profit of 49 cents per share. And the stock has recently been responding to this series of good news reports! 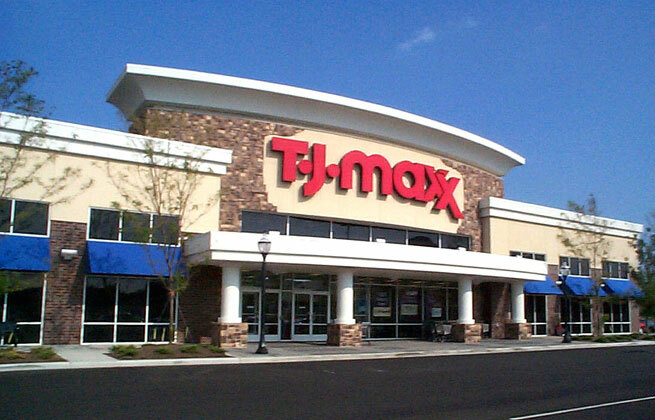 Looking at the latest quarterly report, TJX reported 1st quarter results on May 19, 2009. In the quarter, net sales climbed 1% to $4.35 billion and comparable store sales growth increased 2% over last year. (We can see that for the last couple of months, same store sales growth has been closer to 4-5% each month). Net income from continuing operations was $209 million, and diluted earnings per share worked out to $.49/share compared to $.44/share last year. Excluding last year's "tax benefit", diluted earnings actually increased 17% over last year's results. The company beat expectations of $.45/share on $4.3 billion in sales according to analysts polled by FactSet Research. Reviewing the Morningstar.com "5-Yr Restated" financials from Morningstar.com, we can see that sales have grown steadily from $14.8 billion in 2005 to $19 billion in 2009 and $19.05 billion in the trailing twelve months (TTM). Earnings have also steadily increased from $1.41/share in 2006 to $2.00/share in 2009 and $2.05 in the TTM. Dividends have been paid and increased yearly at least since 2005 when $.17/share was paid. This has been increased annually to $.45/share in the TTM. The company has also been reducing outstanding shares from 512 million in 2005 to 438 million in the TTM. Free cash flow has been steady with $817 million reported in 2007, and $714 million in the TTM. In terms of the balance sheet, TJX is reported by Morningstar to have $1.012 billion in cash and $3.394 billion in other current assets, compared to $3.33 billion in current liabilities and $1.28 billion in long-term liabilities. This works out to a current ratio of approximately 1.3. Looking at Yahoo "Key Statistics" for some valuation numbers, we can see that this is a Large Cap stock with a market capitalization of $14.99 billion. The trailing p/e is a moderate 17.61 with a reasonable PEG ratio of 1.27. There are 413.5 million shares outstanding with 410.97 million that float. Currently, as of 6/25/09 there are 10.25 million shares out short representing 1.9 trading days (the short interest ratio), less than my own 3 day rule for significance. The forward annual dividend is $.48/share with a forward dividend yield of 1.3%. The last split according to Yahoo was in May, 2002, when the stock split 2:1. 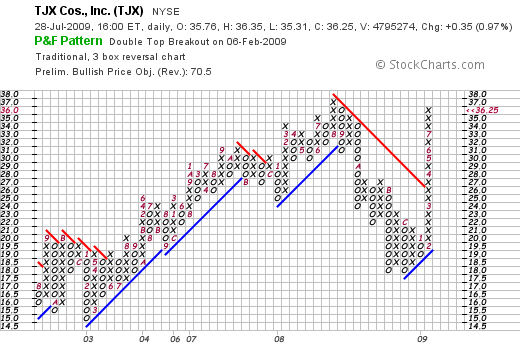 If we review a "point & figure" chart on TJX from StockCharts.com, we can see that after hitting a low of $15.00 in February, 2003, the stock climbed the next 5 years to hit a high of $37 in August, 2008. With the retail 'melt-down' TJX melted with the rest of the stocks to a low of $18.00 where it bounced twice first in November, 2008, and then again in December, 2008, only to tun higher in February, 2008, where it has moved strongly from a $19.50 level to its current level of $36.25! The chart looks quite strong if possibly a bit over-extended in its current move. To summarize, retail is a very difficult place to be 'playing' today. However, maybe the 'cheap chic' so often attributed to Target (TGT) might actually be better-played with TJX. Here is a company that has shown positive same store comparisons the last couple of months, come in with earnings that beat expectations and has raised guidance. Just like old times! Anyhow, this is the kind of stock that I like and would love to add to my portfolio if I get the right signal at the right time. Thanks again for visiting and my apologies once more for being so lax about posting here! If you have any comments or questions, please feel free to leave them on the blog or email me at bobsadviceforstocks@lycos.com. 3M (MMM) and Sysco (SYY) "Trading Transparency" and a Reader Writes: "Just Curious"
Earlier today I sold 4 shares of MMM at $69.92 representing 1/7th of my holding at a 60% gain. I then purchased 125 shares of Sysco (SYY) at $23.19. I recently wrote up SYY (see the prior entry) and continue to be careful in this difficult environment seeking stocks of value with steady and increasing dividends. Answering "Just Curious" I am indeed well, busier than ever at work, and have no good excuse to tell you why I have neglected my blog. I shall redouble my efforts at this. Meanwhile, drop me a line at bobsadviceforstocks@lycos.com if you have any comments or questions. Sysco (SYY) and a New Podcast! 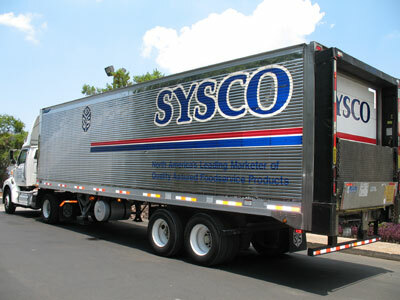 A few moments ago I posted a PODCAST ON SYSCO (SYY). Usually I write up an entry first and then follow with a podcast. Tonight I did it the other way around :). We live in difficult times! I don't really need to tell you about the growing unemployment, the latest bank failures, or what the New York Fed reported on manufacturing. These are things that everyone knows. What is harder is trying to some reasonable place to park one's funds. 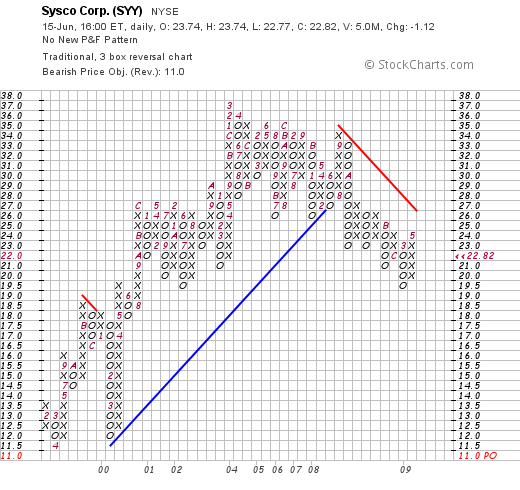 I would like to suggest that an investment in Sysco (SYY) might be a place to find some value and potential growth while waiting for the eventual economic recovery. Sysco (SYY) closed today at $22.82, down $(1.12) or (4.68)% on the day. I do not own any shares of this stock but have owned it in the past and would consider buying shares once again in the future. Looking at a few of the things I like to review, the latest quarterly report was fair. They met expectations on earnings which did decline slightly and came in a little light on revenue. Longer term, looking at the Morningstar.com '5-Yr restated' we see that the company has a record of steadily growing its revenue, increasing its earnings---both of which did recently take a slight dip--paying a nice dividend and increasing it (the company now yields 4%), buying back its shares, increasing free cash flow, and maintaining a solid balance sheet. Valuation-wise, looking at Yahoo "Key Statistics" on SYY, the company has a modes p/e of only 12.74 (trailing) with a PEG estimated at only 1.14. The last split was over 8 years ago. 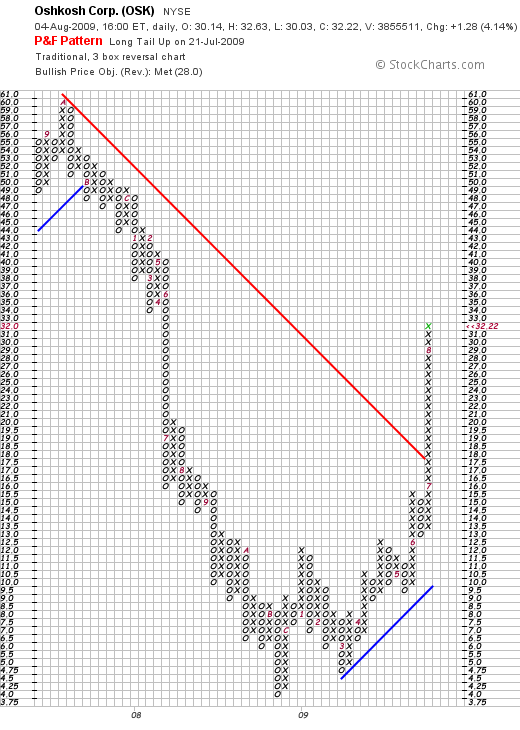 Certainly, the 'point & figure' chart from StockCharts.com is somewhat less than inspiring. I am not sure I agree with the bearish objective of $11/share, but we don't see much in the way of technical support on this particular chart! In some ways this type of 'pick' is out of my usual momentum play. But then again, my own philosophy is being tempered by the difficult environment we are experiencing and the fact that little of the usual momentum type investment is apparent. I would characterize this sort of stock as more of a GARP pick. It shares many of the important characteristics that I look for in a company: the steady growth in revenue, earnings, dividends, and free cash flow. It has been buying back its own shares and carries a solid balance sheet. I even can see evidence of its business with its many shiny trucks on the road right where I work! Anyhow, that's my idea of a 'comfort stock' in these uncomfortable times! If you have any comments or questions, please feel free to leave them on the blog or email me at bobsadviceforstocks@lycos.com. As I mentioned in an earlier blog, my 'trade' in PetSmart (PETM) was intended to be a short-term affair. I had hoped that I could be reporting a large profit from this move which did indeed initially move higher after my purchase of 180 shars on 5/21/09 at a cost of $20.3676. However with the market acting at best erratically this morning and with PETM trading below my cost on this block, I decided to step aside from this additional over-weighted addition and sold my 180 shares at $19.9524/share. This represented a loss of $.4152/share or multiplied by 180 shares came out to a loss of $(74.736). Percentage-wise, this was a loss of (2.03)% so the damage really wasn't significant at all. I still like PetSmart (PETM) and have my 90 share position which I am quite bullish on. However, as a trader, I have always had mixed results and always subscribe to the belief that one is best minimizing losses. Will PetSmart (PETM) turn around tomorrow and prove me wrong? I wouldn't be surprised. But I shall participate in that appreciation if that is the future for this stock. Meanwhile, I have a little more cash built up once again in the account for future investments and yes, an occasional 'trade'!